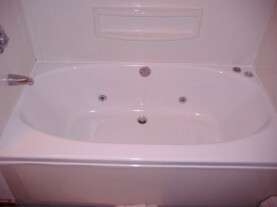 Are you looking to replace or refinish an acrylic bathtub? Acrylic bathtubs can become dull, damaged, or just color dated after years of use. 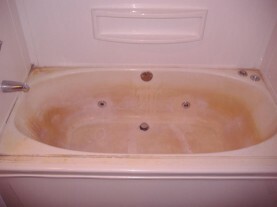 Miracle Method offers acrylic tub refinishing and even color changes to make your tub look and feel like new again. Since acrylic tubs are often installed before the surrounding wall and floor coverings are complete, it can make replacement prohibitively expensive. Miracle Method's refinishing is done without removing the fixture and can save you up to 75% over the total cost of removal and replacement. restored to its former beauty, with no demoltion! Miracle Method's process is completely different from other refinishers because we use our proprietary MM-4 bonding agent to chemically weld the new finish to the acrylic tub. Many of our competitors will not refinish acrylic bathtubs, nor offer a guarantee, because their acid etching process will dissolve acrylic surfaces. Miracle Method will guarantee that the new surface, bonded with MM-4, will properly adhere and provide many years of service. If you are considering replacing an acrylic bathtub, click on Find a Location or call our toll free locator number, 1-888-271-7690 to reach the nearest Miracle Method professional.